The National Lawyers Guild (NLG), founded in 1937 as the first racially-integrated, human rights bar association, is committed to fighting — and ending — all forms of white supremacy. When white supremacists came to Charlottesville, anti-racist protesters did not let them run roughshod over the community’s principles. These people, along with individuals from the Central Virginia, University of Virginia, DC, and Georgetown Law School NLG chapters, along with on-the-ground support from the NLG National Office, presented a unified force against hate and violence. In contrast, the City of Charlottesville instructed its officers to stand down on August 12, 2017 and has since arrested and charged three local residents who were victims of white supremacist violence that day. The City now continues its attacks on those who supported our community that day with a targeted harassment lawsuit against Redneck Revolt, an anti-racist network committed to providing community defense to anti-racist demonstrators and their communities. On October 12, 2017, the City of Charlottesville filed a lawsuit, along with several local business and neighborhood associations, in an attempt to blame “private military forces” for the violence in Charlottesville on August 12. On its face, this seems like good news. However, in reality, instead of focusing on the organizers and participants of the white supremacist “Unite the Right” rally who came to Charlottesville to engage in violence, the lawsuit includes the leftist groups as defendants, Redneck Revolt and the Socialist Rifle Association. Charlottesville filed its suit exactly two months after those organizations showed up to support our city, our businesses, and our neighborhoods, from the onslaught of white supremacist terror. Both groups have an explicit mission of community self-defense; any presence they had in Charlottesville was to protect local residents from white supremacist violence. Indeed, a group of peaceful religious leaders who sang hymns to protest the alt-right’s calls for forced segregation and genocide credited these types of organizations as having saved their lives from violent right-wing violence on August 12. With the City having ordered its police to stand down, these groups were the last line of defense from the alt-right’s planned violence. Now, instead of taking responsibility for permitting the white supremacists to hide their hate behind the First Amendment, the City has filed a lawsuit in an attempt to shift the blame and perpetuate the both sides” narrative, suggesting that leftist groups are just as blameworthy as the white supremacists they helped us defend against. Redneck Revolt is represented by NLG Central Virginia Chapter attorneys Pam Starsia and Jeff Fogel. The NLG is committed to supporting all allies in struggle who defended communities from racist attacks while law enforcement instead stood down and is in solidarity with Redneck Revolt and the Socialist Rifle Association, NLG Central Virginia Chapter,spanning Charlottesville and Richmond, was recently reconstituted amidst growing attacks on people of color and leftist activists by neo-nazis, neo-confederates, and law enforcement in Central Virginia. 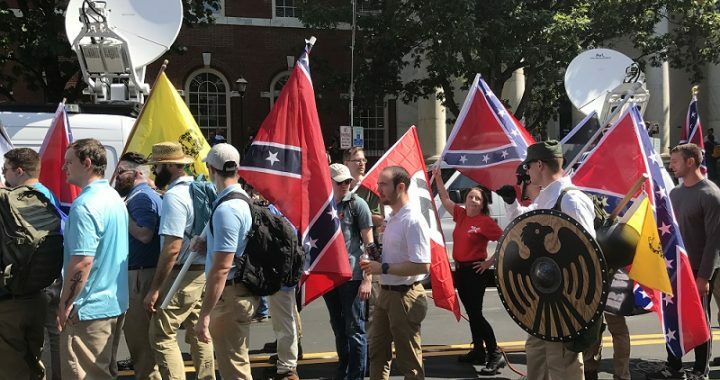 Instead of suing these two groups that protected city residents on August 12, the City of Charlottesville should refocus on its own failure to protect its residents from the violent white supremacists who invaded the community. Posted in Press Releases and tagged alt-right, Central VA NLG, Police, Protest, white supremacy.